Annie Horne is the Managing Director of Planning Solutions Limited. Annie is responsible for leading and developing all of Planning Solution’s leisure businesses. Annie has over 35-years practical hands-on and strategic experience of working in the leisure, hospitality and tourism sectors. 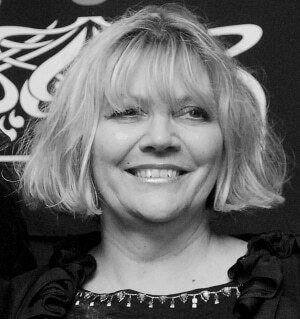 She has worked for a range of private & public organisations and clients from the Isle of Wight Council through to English Heritage and the Solo Promoters Limited, owners of the Isle of Wight Festival. Project Management for the re-creation of the Isle of Wight Festival in 2002. Since that time she has continued to be responsible for numerous individual areas of work on the Festival but primarily she was responsible for creative concept and development, installation and management of boutique venues, stages and bars; artist booking, artist liaison and accreditation, health and safety and licensing compliance, recruitment and staffing requirements for these areas (some 600 staff) and budget planning, management and trading performance. The Festival has a capacity of 90,000 people. Glastonbury Festival – Since 2006 Annie lead the creative installation for a number of boutique venues in a 20,000 capacity arena working closely with landowners, suppliers, contractors and staff. Again, with particular attention to ensuring site health and safety and licensing compliance were delivered. Osborne House Summer Concerts – as the Event Director & DPS Annie led on the development and operation of the outdoor live music concerts, with a capacity of 10,000, at Osborne House with well known headline bands including Westlife, Paul Weller, Girls Aloud, Simply Red, Tom Jones and Little Mix. Annie has also created and managed her own brand restaurant, café bar and live music venue for several years. Formerly Annie was the Director of Wight Leisure for the Isle of Wight Council, where she was responsible for the business development, financial trading performance and all operational services, including marketing and advertising. Annie oversaw the development and management of 18 community and visitor leisure destinations, which included: 4 wet and dry Leisure Centres; 3 fully operational theatres with community, public and school programmes; 12 seasonal activity facilities and attractions; all Island public parks, gardens and open spaces and the Annual Events Programme for the Council.